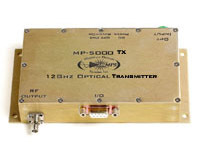 The MP-5000TX is a RF/fiber optic Transmitter designed for antenna remoting and broadband RF transmission applications using singlemode fiber optic cable. The transmitter uses a high efficiency Distributed Feedback(DFB) laser diode with an operating wavelength selected from the ITU CWDM or DWDM grid. The transmitter provides low noise and high dynamic range performance over a wide operating temperature range. Temperature stability is controlled with an integrated thermo-electric cooler (TEC). The transmitter provides status monitoring through the use of an onboard processor that communicates with a host computer over an RS-232 I/O interface. The I/O parameters include laser bias current, temperature and alarm status. When the MP-5000TX RF/Fiber Optic Transmitter is linked with the MP-5000RX 12 GHz RF/Fiber Optic Receiver, the combination provides an excellent choice for your ultra-wideband RF to Fiber Optic conversion applications. 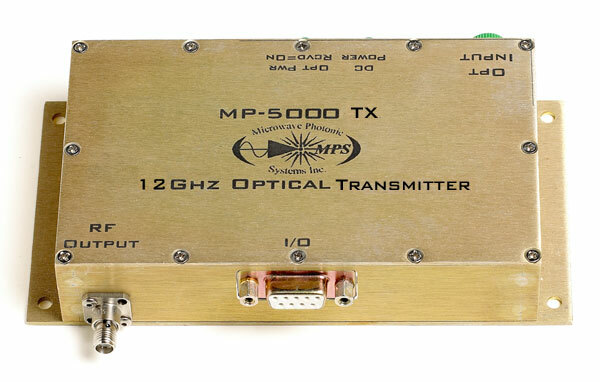 The MP-5000TX can also be paired with the MP-2320RX to provide a high performance 3 GHz link with 0.0 dB link gain. Refer to the MP-5000TX Data Sheet for full specifications and part number generator.